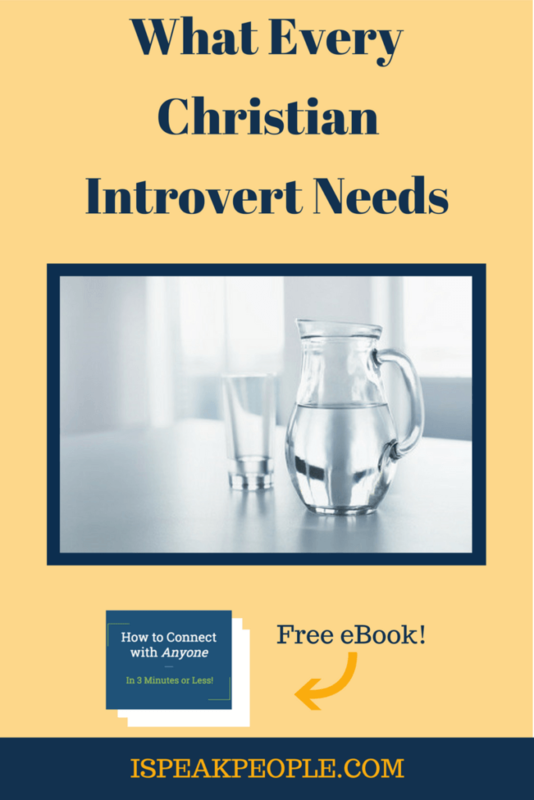 As a Christian introvert, do you know what you really need to grow in your walk with the Lord? If you’re like me, you probably resist this. But there’s no denying you need it to be whole. Back in high school, my church’s student ministry had a slogan. Those three words reminded us to 1) spend time with God in His Word and in prayer, as well as 2) serve the church and share the Gospel. Both components were vital. Without drinking, we’d have nothing to give or share. But without flowing, we’d fail to love people as Jesus calls us to. Drinking is more natural for the introvert. We’re quiet and reflective and gravitate toward private bible study and prayer. While extroverts typically act, think, and then act again, we think, act, and then think. It’s not that we’re apathetic bench warmers. It’s just that the action is in our heads – and that’s where we like to keep it. Unfortunately, we can’t stay there. Similarly to how babies need to be born to keep growing, we need to leave our comfort zones to become the people God wants us to be. One reason we can’t keep to ourselves is that we need community. No Christian introvert is an island. We need to belong, and that usually happens in groups. Small groups – bible studies, Sunday school classes, and accountability circles – are where life-on-life change happens. There, friends challenge us and hold us accountable; we do the same for them. We confess our sins to and pray for one another. And we spur each other on toward love and good deeds. We need large groups too. God revives our hearts and renews our spirits as we gather with the body of Christ. Through collective singing, we worship God, admonish one another, and encourage those who are weary. Worship gatherings are times to search the scriptures together. We celebrate new life in Christ and steps toward Christlikeness. God also calls us to serve one another. The body of Christ is beautiful in its diversity. Because none of us is a teacher, prophet, pastor, benefactor, and encourager, we need each person’s gifts. A body isn’t a body if it’s just an arm or an eye (1 Cor. 12). And don’t spurn your own gift. God created you to contribute. In his book You and Me Forever, Francis Chan describes our spiritual health. He says we consume, consume, consume but almost never act. As a result, we’re so spiritually obese only a forklift could move us. Still, for some reason, we’re certain our need is more knowledge. We need to do something with what we know. Finally, before he ascended into heaven, Jesus commanded us to make disciples. It was the last thing he said, so it must have been important. I know what you’re thinking. None of us likes to be laughed at or rejected. And no Christian introvert loves to talk to strangers. But who are we following, anyway? Jesus said, “Whoever wants to be my disciple must deny themselves and take up their cross daily and follow me.” (Luke 9:23). We can’t obey and keep to ourselves. The only way we’re going to grow and please the Lord is to get out of our heads.